I bet a lot of people are wondering whether or not it is difficult to train a flighted parrot (particularly one that was never clipped). Well the good news is that for the most part is is barely even noticeable that a tame hand raised baby parrot isn't clipped at all. Truman will make several large flights per day where he goes back and forth down the room a few times and may fly off or to another place from time to time. For the vast majority of time he is out however, Truman is not flying around all over the place but rather on a perch playing with stuff. The few flights that he does make are pretty harmless and would certainly not be worth clipping him over. Here is a video that presents some of the realities of trying to train a flight capable parrot. Sometimes things don't go the way you want to. I'd like to share some footage that was taken as part of the wave training but not included to avoid distracting from the wave technique. This is just to illustrate some of the other things that go on when training a not clipped bird. Sometimes things are not so easy though. For instance in the middle of wave training Truman randomly decided to take a lap around the room and then eventually landed on his cage. He certainly wasn't planning on going there because he flew the other way first but it just happened to make a good landing site when it caught his eye. I try not to reward him for these fly offs by giving it unnecessary attention or treats. Sometimes I will walk over and get him after a brief wait. Other times I will recall him back to me. Another time during wave training Kili just decided to fly straight at him. Truman took off and Kili followed him in close pursuit. As Truman rounded the far end of the room I called to him and he came back to land on me while Kili found an alternate landing spot. Eventually I called Kili back too but not right away in order to deny her attention for her little stunt. All in all, keeping a parrot flighted presents many more training opportunities than hindrances. However, it does require extra patience to be able to work with the occasional fly off. You have to accept that you cannot control the parrot and it is free to fly away whenever it wants. Yet with good training and a positive attitude you can teach the parrot to want to be with you and want to train. Ultimately it is far more rewarding to work with a flight capable parrot that cooperates with you because it wants to and not because of a stroke of scissors across its wings. I had been hoping you'd eventually post up some "oops" moments so people don't wind up thinking your birds are complete little angels! At least in the video Truman returns on the recall so obviously you have alot of work and time into the training and they have ALOT of trust in you. Keep up the good work Michael! Thanks for posting the video of the "out takes" from your training session. It is very encouraging for me to know that things don't always go as planned. The finished videos always seem to give the impression that the birds just sit there and behave, and maybe a clipped parrot will do that. I love the fact that your birds are fully flighted. I have one out the the eight that I own that is fully flighted. I figured that it would be best to work with him first, and then once I have gone through the learning curve with him, I will have some important personal experience to work with when I train the other parrots. I can't thank you enough for all your hard work and generosity. I eagerly await each and every video and blog post you provide. What would you suggest bird owners with fully flighted parrots do when your parrot just flies off during training? For instance, my parrot will sometimes fly off back to her cage which is in another room. If I ignore her then she learns she can fly away whenever she wants to be done with training. If I immediately go get her then she learns it as a game and will do it nearly all the time. It feels like a damned if you do damned if you don't scenario. P.S. My bird isn't flight recall trained yet. Would you suggest that be done ASAP so that I can attempt to flight recall her back after she flies off? Well this is a motivation issue. 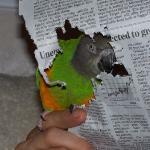 What you need to realize is that there are other things the parrot would rather do then train. Either try using those "other things" as reinforcement or focus on making sure that the parrot actually wants the food treats you have to offer. Don't get too worked up about it. Let the parrot go and think about making it more effective next time. Forcing a parrot to train that doesn't want to won't learn anything good from it anyway. Awesome. Thanks for the response. Makes sense to just let her go and "stew" about it because now she isn't getting any treats. She doesn't get treats any other time other than training. Your 100% right. As I look at it I think that she just isn't motivated enough the times she flies away. I might need to start feeding her less during her meals, as long as she remains a healthy weight! I adopted a 12 year old Quaker from a rescue organization. He was afraid of hands and was biting. Therefor, I thought first of all he needs to learn to trust me. I started target training. At the same time I taught him to fly. Before, he did not know what his wings were for. It took some time to strengthen his week muscles. I have Louis only since August last year. He became more confident and happy. I encourage him to fly by saying excitedly : " Louis can fly!" Then he flies a big curve and comes back to his cage. When he thinks he has enough he lets me know. Fortunately, he is very food oriented and loves treats. That way, we are progressing slowly. Biting is now a more seldom nipping/testing. He even wants to be petted and crawl into my big sweater folded up. Then I can touch his beak and his whole body Through the sweater or I have to cover my hand with a sleeve. Recall flight and harness are in the future. With patience we will get there. Louis is very smart and talking up a storm, always in context. He speaks now German and English. He is amazing. Perhaps, I should have concentrated in the beginning more about training. But Louis was so terribly afraid of everything. He is now fully flighted. I think, every parrot is different or in a different situation. I appreciate advice.